This summer, I am posing a challenge to gardeners across North Carolina—plan an edible garden party! Celebrate your achievements as a proud grower of food. Serve as inspiration to others in your community by hosting a party where guests can learn and eat the delights of the harvest. My goal as a horticulture professional is to influence everyone to enjoy growing plants. The more people preaching and teaching the gardening way of life can only lead to happier and healthier communities. Such a festivity could be a small gathering, such as a “Broccoli Brunch” or a “Cabbage Cook-Off.” Consider adding an edible element to your 4th of July bash, such as “Melon Merriment” or “Cool as a Cucumber.” A “Pepper Party” is a great reason to gather when the late summer dog days set in and harvests are abundant. The possibilities are endless, from cocktail hour to ‘garden-to-table’ dinners, and any time spent celebrating in a garden is an opportunity to inspire and educate. My favorite edible garden party theme is easy and dramatic. Each summer, my husband David and I open our home garden for an evening fete celebrated with friends, family and members of our local community of Fuquay-Varina, NC. On this night we indulge in the almighty American favorite—the heirloom tomato. 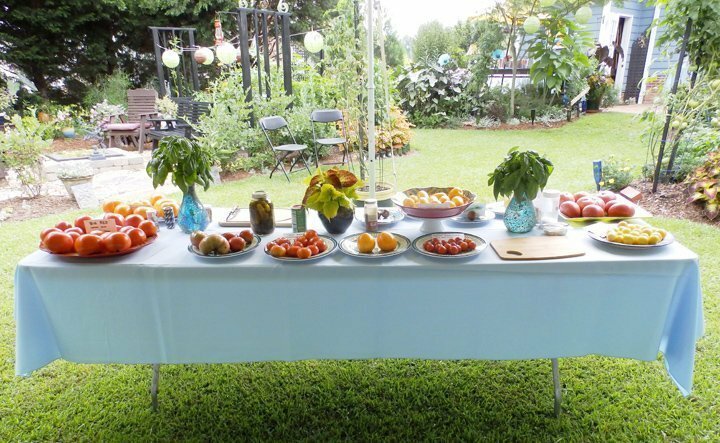 The “Tomato Tasting” is part of our garden’s identity and purpose. Tomatoes have long been called the gateway plant to gardening. It is an easy crop to grow with high yields and a wide range of varieties to choose from. Heirloom vegetables are special; they have rich histories and provide insight to gardens past. They also provide flavor beyond belief. The tomato tasting planning begins as I order new-to-me seed, my favorite way to pass time in the cold, dark winter. As the days get longer and warmer, the seeds are sown with great anticipation. By the time the poppies have finished blooming in late spring, the tomato plants are knee high. Following the solstice the vines explode into growth, towering overhead 8 to 15-feet tall with proper staking. As July comes to a close the heirloom tomatoes are at their peak, with production continuing into autumn. 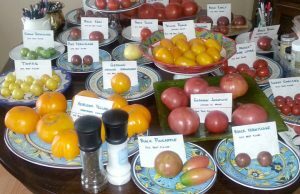 This year I have sown 60 different varieties of heirloom tomatoes. They represent an extensive range of fruit color, taste, size and landscape value. I plant one of each variety throughout our edible landscape; from the street to the foundation every garden bed has tomatoes represented. As guests arrive, they meander through the garden judging each tomato plant for its ornamental quality and showiest fruit on the vine. Positioned as center stage, the ‘tasting tent’ is where the true magic happens. Long tables are set up filled with colorful fruits, cutting boards and knives. Each variety is labeled and assorted salts, basils, oils and vinegars are available to make every bite special. Hosting this annual edible garden party serves as great motivation for my husband and I to maintain a beautiful suburban landscape full of whimsy and information. I like to track sowing, planting and harvest dates along with the name of each plant and seed source. Full descriptions are posted on the tomato cage to provide further insight. The intellectual component of gardening must be shared so that newcomers can become successful growers. In early August we host our Annual Tomato Tasting Benefit. As we celebrate the taste of summer we will raise money for a specific garden program in the Triangle. Donations will be accepted in a variety of ways during the event. Tip jars will be placed on the tasting tables, with the tomato earning the most money declared the winner. The grassroots edible movement is one of the most exciting trends that modern day horticulture has ever seen. Please accept my challenge: throw an edible garden party this summer and have fun as you encourage others to adopt the value of home gardening. Brie Arthur enjoys growing edibles with her husband in their one-acre suburban garden in Fuquay-Varina.